Show that you are familiar with the terms used to describe birds by sketching or tracing a perched bird and then labeling 15 different parts of the bird. Sketch or trace an extended wing and label types of wing feathers. Explain what the specification numbers mean on binoculars, a spotting scope, or a monocular. Show how to adjust the eyepiece and how to focus for proper viewing. Show how to properly care for and clean the lenses. Describe when and where each type of viewing device would be most effective. Note the date and time. Note the location and habitat. Describe the bird's main feeding habitat and list two types of food that the bird is likely to eat. Note whether the bird is a migrant or a summer, winter, or year-round resident of your area. Go on a field trip with a local club or with others who are knowledgeable about birds in your area. Keep a list or fill out a checklist of all the birds your group observed during the field trip. 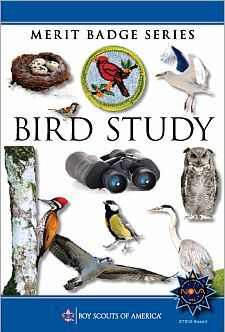 Tell your counselor which birds your group saw and why some species were common and some were present in small numbers. Tell your counselor what makes the area you visited good for finding birds. By using a public library, the Internet, or contacting the National Audubon Society, find the name and location of the Christmas Bird Count nearest your home and obtain the results of a recent count. Explain what kinds of information are collected during the annual event. Tell your counselor which species are most common, and explain why these birds are abundant. Tell your counselor which species are uncommon, and explain why these were present in small numbers. If the number of birds of these species is decreasing, explain why, and what, if anything, could be done to reverse their decline. Build a bird feeder and put it in an appropriate place in your yard or another location. Build a birdbath and put it in an appropriate place. Build a backyard sanctuary for birds by planting trees and shrubs for food and cover. Explain the differences between extinct, endangered, and threatened. Identify a bird species that is on the endangered or threatened list. Explain what caused their decline. Discuss with your counselor what can be done to reverse this trend and what can be done to help remove the species from the endangered or threatened list.